while he was sitting at the entrance to his tent in the heat of the day. 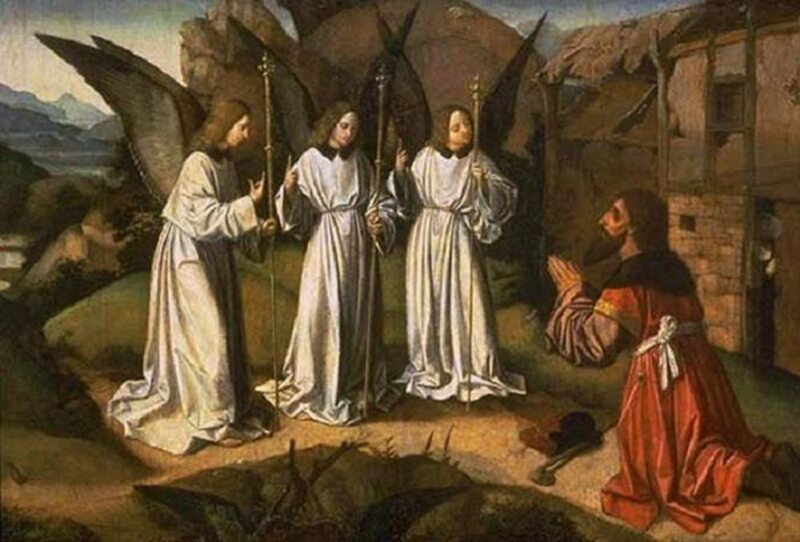 Abraham looked up and saw three men standing nearby. Before the beginning when God created the Heavens and the earth, there was the Holy Trinity. The eternal life from whom creation flows is not a static lonely god, but an intimate and relational triad in perpetual motion and with infinite possibilities. The traditional language used to describe the natural state of God is one in three, or three in one; the Father, Son, and Holy Spirit – yet only one God. The primary importance of the Trinity is not found in the distinct persons within it, but in the relationship between them. It is in this circular dance of the persons of the Godhead that history unfolds, and the universe is given life. The three persons of the Trinity are not varying aspects of the same God – like I am a father, a son, and a preacher. The Trinity is not different states of the same matter – like ice, water, and steam. The Trinity firmly denies any attempts to conform it to the wisdom of this world. Instead, the Trinity is three distinct individual people while still being one whole and undivided person. In its very essence, and in its ultimate truth, it must be a paradox when viewed with human eyes. Just as Abraham addressed his three visitors as one Lord, so do we approach the one true God and see three distinct faces. 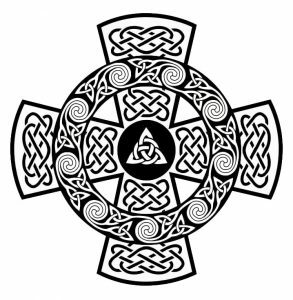 The doctrine of the Trinity is one which very clever modern minds like to attack as spiritual mumbo jumbo with no rational basis behind it – yet, while the doctrine of the Trinity is beyond the wisdom of this world and the confines of the human mind, it is far from being illogical – or without practical value. If our doctrines of God were simple enough for the human mind to comprehend with ease then they would not be nearly large enough to say anything of real value about God. Yet, for far too long we have been told not to think too hard about the Trinity – we are simply supposed to accept the impossible as a matter of faith. Now, faith is a word that has been perverted to mean accepting the impossible for no real reason because a priest or a pastor somewhere told you to – when really it should mean to trust in something larger than yourself for very good reason because you know it to be worthy of your trust. I pray then, dear reader, that you may suspend your disbelief long enough to seek the wisdom embedded in what is arguably the most foundational doctrine of the Christian religion – that God is both one and many. May the Triune God give you faith which can move mountains so that you can believe in what is beyond you and trust in what you cannot see. I pray you have the humility to step outside the wisdom of this age and into the wisdom of God. Embrace the paradox and in that foolishness you may develop eyes which can see, ears which can hear, and a heart which can love. We can easily imagine a one-dimensional line, a two-dimensional square, and a three-dimensional cube – but there our minds are halted by their limited nature when we try to imagine a fourth dimension. Yet, mathematicians have given us the tesseract, which is to the cube as the cube is to the square. Just as a square’s surface is made of four lines and cube’s surface is made of six squares, a tesseract’s surface is made of eight cubes. This is, of course, only possible with a fourth spatial dimension, one that, as far as we know, does not exist. While we cannot ever properly envision one or even conceive of what a four-dimensional universe would look like, we can still know mathematically that it is a possible thing to exist. In much the same way, we cannot ever fully envision how the trinity exists – but we can understand that it could exist in a way which is beyond our limited perspective. In understanding the existence of the trinity, and some of its principles, we can apply that reasoning to explain other questions and come, perhaps, to understand our own lives better by glimpsing what life beyond our own might look like – just as one understands the potential of a square much better when one realizes what a cube is like. Accepting the doctrine of the Trinity is helpful both spiritually and philosophically. For now, let us examine some of the philosophical ways that the Trinity can help us understand reality. Then, once we have explored the fruits of knowledge we can begin to explore the fruits of the eternal life which is bound up within the Trinity. In the thirteenth century one of the most prolific theologians in Christian history, Thomas Aquinas, put forth five arguments defending the existence of God. Without going into the details of all five arguments we can take a look at some of the basic principles he was using. Aquinas argued that anything which is exists or is in motion has been acted upon by an external force. Anything which exists has been brought into existence for some reason and anything which moves has first been either pushed or pulled. Essentially, everything happens for a reason. If you see a pool table with all the balls moving around you know that someone hit them with a cue. You also know that something has brought the table and the balls into existence, someone constructed the table out of natural materials – and in turn those natural materials existed because of natural geological processes which collected the molecules together. But, as Aquinas realized, if everything happens for a reason, and if we could trace those reasons back further and further, there are only two options as to what we would find. Either there was a first cause which set the universe in motion and brought everything into existence or time has no beginning and there was no first cause. It was common in the early scientific community to believe the latter position – that the universe had always been and that there was no beginning to time, however, in more recent decades we have discovered that the universe indeed did have a beginning, and that there was an initial event that set everything in motion. And this makes sense philosophically as well as scientifically, if there was no first cause then where did all this motion come from? Most people in the science vs religion debate (which typically tends to be based on gross misunderstandings and petty bickering from both sides) agree that there was a first cause, namely the big bang. The question at hand then becomes what the nature of this first cause is, whether it was an eternal consciousness that we call God or simply a natural consequence of physical laws. There is no objective scientific answer to this question at this time, and perhaps there never will be. However, we can still explore this question in terms of philosophical inquiry and mystical experience. For now, we will stick with philosophical inquiry. As Aquinas aptly pointed out, in order for anything to move it must be acted upon by another force and for anything to come into existence there must be a force which brings it. So, if the universe itself had a beginning then what was the cue that struck the balls and started everything rolling about? Aquinas called this proverbial cue stick God while others will think of it more as a natural consequence of physical laws. However, the first question we asked in this inquiry still applies to both these explanations – What caused God? What caused the law of physics? The line of reasoning Aquinas brought about is that there must be something outside of this chain of events which is not confined by the necessity of it all. In order for there to be anything at all there must have been something which started it and that something must be outside of the confines of logic or else it would be caught in the endless trap we have already described. So, then, the question becomes: what could exist outside the boundaries of physical laws and mathematical principles, time itself, and even logical necessities? This something we will call God and this God must exist, like the tesseract, in a way which is beyond the ability of our minds to grasp. Yet, like the tesseract, we can see from observing natural phenomena that its existence is very real, despite our inability to visualize it. Where I will depart from Aquinas, and where I think the Trinity has an important role to play in this discussion, is that Aquinas thought God was both an uncaused first cause and an unmoving first mover. The main argument put forth by atheists against this is that it defies Aquinas’ first argument, that is that everything has a cause. The Trinity, by its very nature, is a relational being. In this dynamic dance each person of the Trinity is constantly creating the others and spurring the others into motion. In this way, God is not an unchanging or unmoving entity but instead an endless fountain of creation and change – a perpetual motion with infinite possibilities. Aquinas believed that a motionless and unchanging God must be the necessary first cause. But how can something motionless create motion? The doctrine of the Trinity solves this issue by demonstrating that God is not motionless but quite the contrary – a fountain of perpetual motion. It is the interaction of the trinity which allows for this motion to take place. The Father compels the Son and the Spirit, the Son compels the Father and the Spirit, the Spirit compels the Father and the Son. A web of interaction is created between them which can multiply and refract into an infinite number of possibilities. Yet, some would ask, why must we assume this initial source of movement and creation has an intelligence at all? Many atheists would argue, again, that this could simply be a movement of natural forces compelled by natural laws. Aquinas addressed this by pointing out the intricacy and intentionality of the laws which govern the universe, not by denying them. To simply accept the existence of natural laws without question is naïve – why are there physical laws at all? Why do those laws allow for such intricate and diverse order? What was the initial cause that brought these laws into being? Given that the natural laws of physics and logic are the ones that have given rise to the need for a first cause, it is hard to believe that they themselves are responsible for there being any universe at all. The first cause must transcend this reality entirely if it is going to satisfy the need for a first cause without being caught in the trap itself. No, I’m afraid the physical laws are clearly created along with the rest of creation and the depth of purpose behind them must surely speak to an intelligent design. The laws of physics and logic could be non-existent altogether or they could be radically different and not lead to an ordered universe which gives rise to immensely complex forms of matter, energy, and life. Something beyond this reality has made the universe as it is and that something has made a beautiful piece of artwork where a chaotic collection of random substances could be instead. And so, this intelligent being existing, like the tesseract, beyond our capacity to understand and in an eternal relationship of co-creating and co-propelling is the reason there is something other than nothing and that we enjoy the seemingly infinite complexity of the natural order that gives rise to our very existence and the planet the we call home. However, while all this philosophy is well and good and can help to sooth the mind into acceptance and allow it to let down its guard to open the gates of the heart, the most compelling evidence one could ever find as to why we should assume this first mover to be intelligent is simply mystical experience. We know intelligence entirely through experience – you know that your friends and family have minds because you interact with their minds. This is, in fact, the only possible way to determine intelligence, there is no test other than experience. For one mind recognizes another and anyone who has spent adequate time experiencing the mind of God knows it to be a mind. One can theorize about a tesseract and draw it on paper and point to its existence by means of logic, but if one could glimpse it, just for a fleeting moment, even if that understanding left you once you returned to your three-dimensional mind, the sense of its realness would never leave you. I compel you, dear reader, if you wish to truly prove God’s existence, the loving perpetual relationship of the Trinity, and the infinite source of possibility contained therein, then seek to know God not with philosophy, but with the heart – for knowledge can only take you so far. To know God is not to understand God, but to love God and to be loved by God – for that is the peace which passes all understanding, and which guards our hearts and minds from themselves. Have recently been reading Standford Caldecott’s “The ReEnchantment of Education,” which has a couple of chapters about a related understanding of numbers and the universe. There, he discusses Sacred Geometry and the Pythagorean understanding of numbers and math, which was not just quantitative but also both qualitative and even contemplative. This was a lovely addition. Thank you! I have a bit of familiarity with sacred geometry as well. There’s something so fascinating about the perfection of the mathematical world!